LA JOLLA SHORES,CA – (November 29-December3,2017) AccesSurf today announces the Hawaii Adaptive Surf Team has placed 5th in the world as a team at the 2017 ISA World Surfing Championships. In addition to the team standing they proudly brought home 2 Gold, 1 Silver,1 Bronze and 2 Cooper medals in the individual divisions. The Hawaii Adaptive Surf Team represented with a team of 10 adaptive surfers. The 2017 ISA (International Surfing Association) World Adaptive Surfing Championships was held in La Jolla Shores CA. 109 surfers with disabilities from 26 nations competed in the 4 day competition. 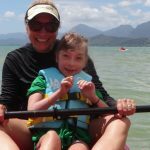 This was a historical event as this year marked the first for the ISA to include women’s divisions with the ISA World Adaptive Surfing Championships. Hawaii won 4 medals in the women’s divisions including 2 Gold medals. Adaptive surfers (surfers with physical disabilities) compete in 6 divisions – AS1 (Stand/Kneel), AS2 (Stand/Kneel), AS3 (Sit), A4 (prone), A5 (prone) and V1 (visually impaired). The ISA has modeled their world championships after AccesSurf’s Hawaii Adaptive Surfing Championships at Duke’s OceanFest. Established in 2006, AccesSurf empowers individuals with physical disabilities through accessible water programs. The Hawaii Adaptive Surf Team is a program of AccesSurf established in 2014. They train throughout the year and compete locally, nationally and internationally.